Tutorial | Nyahoon Games Pte. Ltd. This tutorial shows how to add a Dynamic Shadow Projector object into a scene. Now, the scene has only a main camera and a directional light. 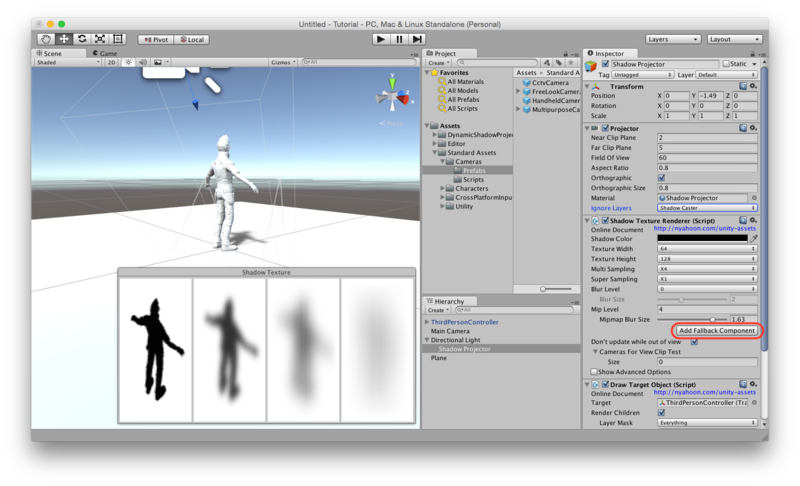 In the project, there are DynamicShadowProjector and Standard Assets (Camera package and Character package). You will already have a terrain object and a player character object in your scene. 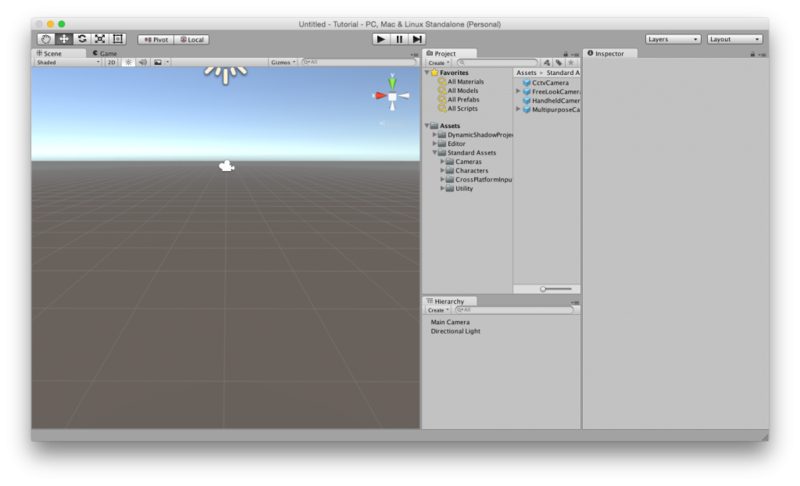 In this tutorial, I use a plane object as a terrain, and ThirdPersonController in Standard Assets as a player character. If you can see a shadow at this point, it is a shadowmap. 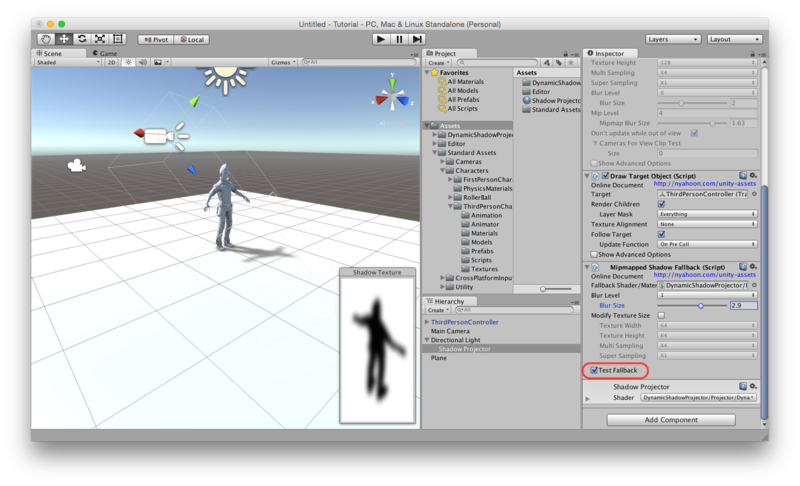 Select the directional light in Hierarchy view, and change the Shadow Type to “No Shadows”. If you want to use GI, it might better to use Quality Settings to disable shadowmap. 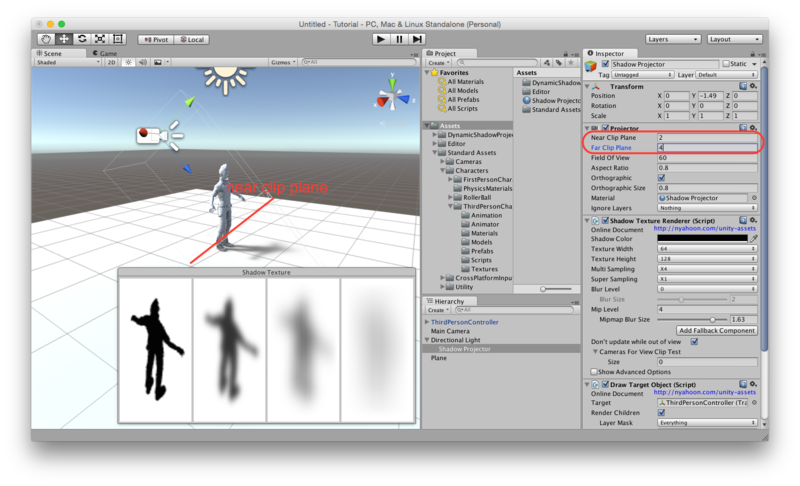 Create an empty game object under the directional light, so that the transform of the object can be same as the transform of the directional light, and name the object “Shadow Projector”. Click “Add Component” button in Inspector view, and select “Scripts” > “DynamicShadowProjector” > “Draw Target Object”. The shadow projector object should have Projector component, Shadow Texture Renderer component, and Draw Target Object component now. 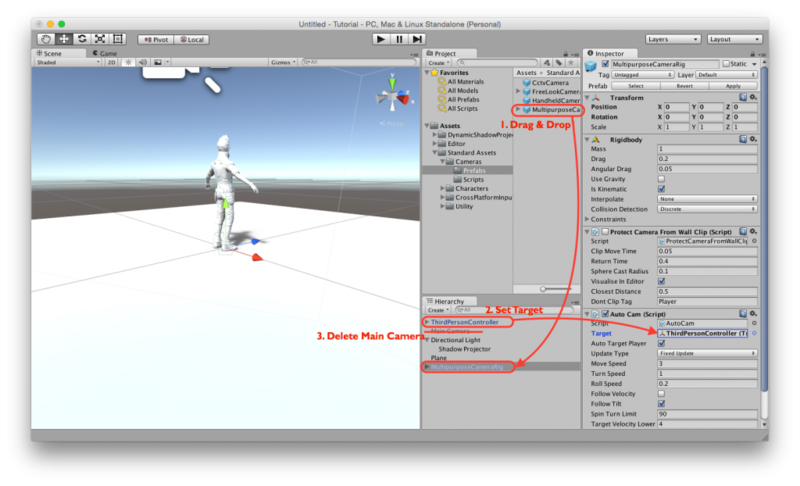 Drag ThirdPersonController object (character object), and drop it into Target field in Draw Target Object component. Next, you need to create a material for the Projector component. Right click in the Assets folder, and select “Create” > “Material”. Then, name the material “Shadow Projector”. You can use any projector shader for this material, for example, “Projector/Multiply” shader in Effects package of Standard Assets. In this tutorial, I would like to use “DynamicShadowProjector/Projector/Dynamic/MipmappedShadow” shader to demonstrate Percentage Closer Filter like soft shadow. Select the shadow projector object in Hierarchy view, drag the projector material and drop it into the Projector component. Now it is ready to draw a shadow. Set the parameters of Projector component, and adjust the position of the projector object in Scene view as in the below image. Please be noted that the right value of the position will change according to the position of the character object. Make sure that the shadow image comes in the center of the texture. To take advantage of mipmapped shadow shader, you need to change texture settings as in the below image. You will see several shadow images in Shadow Texture window in Scene view. The left most image is the image of mip level 0, and the right most image is the image of the most highest level. In spite of the blurry mipmapped shadow texture, the character object still has a hard shadow. This is because the image of mip level 0 is always used for the shadow. A mip level picked by mipmapped shadow shader is derived from the distance between the near clip plane of the projector and a point where the shadow is dropped. That means, mip level 0 will be used for drawing a shadow around the near clip plane, and the highest level will be used for drawing a shadow around the far clip plane. So, the clip planes of the projector component need to be adjusted to make the shadow more blurry. If you look at the character from behind, you will notice that the shadow is casted on the feet of the character. 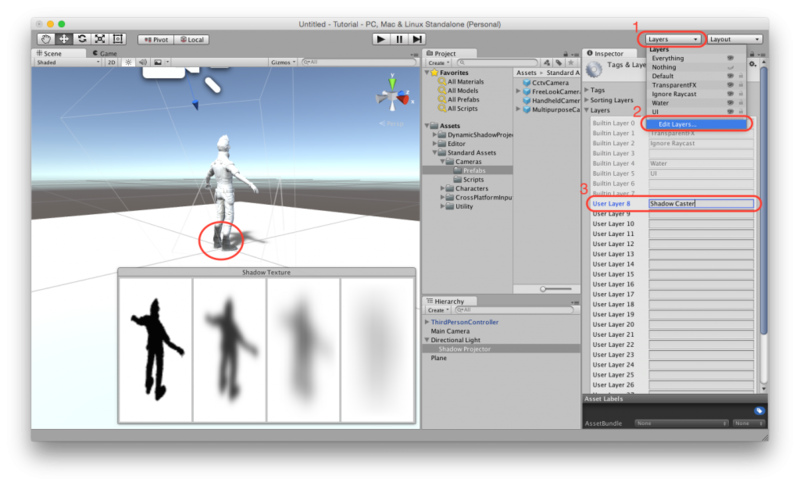 To remove the self cast shadow, you need to add a layer for the character object. 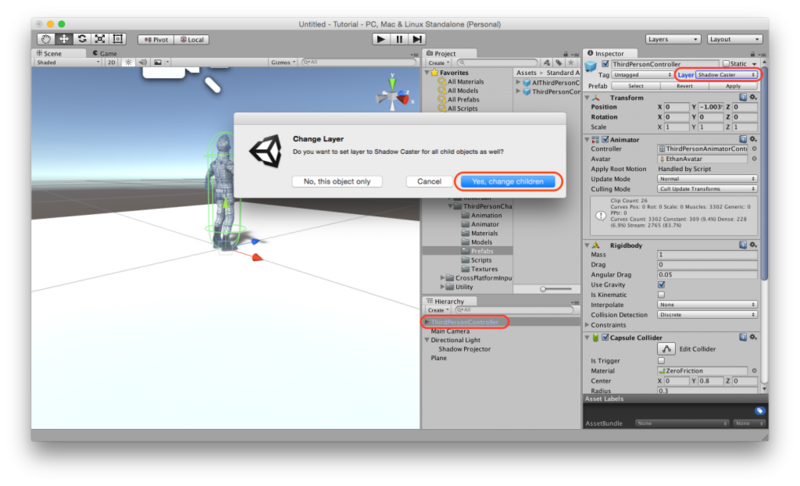 Click the “Layers” dropdown at the top right side of Unity window, and select “Edit Layers…”. Then you will see “Tags & Layers” settings in Inspector view. Input a layer name to any of User Layers. Select the character object, and assign the layer in Inspector view. Go back to the shadow projector object, and add the layer to “Ignore Layers” field in Projector component. Then, the self cast shadow will disappear. The shadow looks perfect now, but there is one more step left. Mipmapped shadow shader uses tex2Dlod function. It requires shader model 3.0 (DirectX), OpenGL ES 3.0, or OpenGL ES 2.0 + texture lod extension. So, it might not work on some old devices. It is better to prepare a fallback for those devices, especially if you are targeting mobile devices. Click “Add Fallback Component” button in Inspector view. Then, Mipmapped Shadow Fallback component will be added to the shadow projector object. If you check “Test Fallback”, you can test the fallback in Scene view, and adjust the fallback parameters. It’s time to test the scene. To make it easier to check the shadow, let’s add a camera rig. Drag & drop MultipurposeCameraRig in Standard Assets into the scene, and set the character object as a target of the camera. Don’t forget to delete the old main camera. Now, you can play the scene. Control the character with arrow keys or A D W S keys (Move), and with space bar (Jump). I followed your instructions with a simple cube and plane but could not get it to work. Your two samples didnt work either. I have Win 8.1, Unity 5.0. Can you post an example please. I tested on Win 7, Unity 5.0.3, but I couldn’t reproduce the problem. Can you check if the materials in Shaders folder are valid or not? And if not, please re-import those materials. If you still have the problem, please delete the asset and download it from Asset Store again. this asset can use for unity 4.6.1? No, it requires Unity 5.0.1 or later, because it uses new Unity 5 feature (command buffer). Thank you for the nice tutorial I got super good shadow for my project.I only have one question that drives me crazy ,why the shadow dosent react my characters moving when i use it in my project.like when my character is running the shadow is moving with it but without running action. Do you change the character’s mesh or child objects after scene starts? Dynamic Shadow Projector creates a command buffer to draw a shadow onto a RenderTexture when scene starts. I guess, your animating character has a different mesh than the one referred from the command buffer. If so, you might need to call SetCommandBufferDirty() or UpdateCommandBuffer() methods of DrawTargetObject component. Great asset, all I needed, but I REALLY need a tutorial on how to add it in a land with trees for example, the ground should cast shadows on himself but does not work nothing as expected, it has a problem in the follow target and the worst of all is that that projector size does not fit the terrain. HELP ME URGENT! Thanks for your feedback. Unfortunately, this asset is not designed for terrain. If you need shadows of trees, I recommend you to use a shadow map or a baked light map. Are there any plans to make this work for VR headsets? Right now, the shadows move around as you move around your head. As an alternative, can the shadow be baked to the surface receiving the shadow? It seems like the camera used for rendering shadow texture is rotated by VR SDK. It is hidden in ShadowTextureRenderer component. Do you know how the SDK controls cameras, and how I can disable it? I am trying out your package on Unity 5.6 Beta 5. Every time I get to the point of adding the “Draw Target Render” script, Unity crashes. Adding the Projector component manually is fine, but if I then add ShadowTextureRenderer, it crashes as well. It all works fine in Unity 5.5.0p3. I’m using the Beta because it has a lot of fixes for baked lighting which I plan to make heavy use of. Thanks for the bug report. Currently I cannot download Unity 5.6 beta because of slow internet connection. I will check it later and I will reply again if I could fix it. Perhaps that can help point you in the direction? I have done some more experimenting. I took a working “Dynamic Shadow Projector” project from 5.5 to 5.6, this avoids the crash I spoke about in my first message. This gives me a grey quad instead of my character shadow. If I then set set Blur Level to 0, the shadow renders correctly. Not a proper fix, but maybe it helps you narrow down some of the issues. From looking at the code, perhaps the issue is something to do with “useIntermediateTexture”? I’m very keen to use this plugin for my project moving forwards, I was able to get some great results with it in Unity 5.5 🙂 Thanks for making this public! This fix can remove the error message that was shown when a projector clicked, but I don’t think this is the main reason for the crash. I guess some of the shaders that are used for blurring are not working. This asset does not call any native code, and I am sure that the crash had happened inside Unity Editor. I will download and test Unity 5.6 as soon as possible, but it would be helpful if you can send a crash report to Unity. I think this error explains why Unity Editor crashes on some platforms. I tried inserting Camera.SetupCurrent(m_camera); at ShadowTextureRenderer.cs:594, but I still got the same error. I will continue my investigation. I noticed that every time when I edit a script file, Unity Editor crashed if there were ShadowTextureRenderer objects in the scene. Also, I tried to fix the grey quad problem, but I couldn’t find a solution. I just sent a bug report to Unity. Please wait until they give me a reply. I was getting crashes whenever I tried to edit ShadowTextureRenderer.cs as well. I didn’t know if the same was happening in earlier versions so ignored it. Do you have a link to the bug you reported on Unity’s issue tracker? They recommend that you also post the issue/case ID in the beta forum for any beta specific issues to make sure they get looked at. I haven’t had a chance to try it yet, but looks like it will require code changes from your end anyway to make it all work. I simplified the grey quad problem, and I found a workaround. The problem occurs if the camera has a non-null targetTexture and a temporary texture is used for the actual render target. If null is set to the targetTexture in OnPostRender function, it works. The code is at ShadowTextureRenderer.cs line 890 (OnPostRender() function). Cheers for the workaround and getting the bugs reported so quickly. I will try the workaround when I manage to get back to lighting/shadow work! Now that Unity 5.6 has been officially released, I thought it would be a good time to go back and check my project with it as we need some of the fixes they have made to baked lighting. I have implemented both of your fixes/workarounds, the changes to RemoveUnuserMaterialPropertyData and also the change so the targetTexture is set to null. just before the call to Render(), but this doesn’t seem to have any effect. The bug you initially reported has been fixed in Unity 2017, I contacted Unity a number of weeks ago asking that they backport the fix to Unity 5.6 as we won’t be able to migrate the game to Unity 2017 (we’re locked in for Unity 5 lifecycle as we paid for the licenses already). They have said they will look into it, but we have not heard back as of yet. Sorry for the inconvenience. I made a patch for version 1.0.5. You will still see the error messages, but it will be only once. It seems like it is impossible to avoid this error message. I believe that is a Unity’s bug. This patch includes all other workarounds for Unity 5.6. I will submit this update to Asset Store as well. If you have 10 characters, you need 10 projectors. However, if those projectors share a same material, they won’t work properly on Editor. When the scene starts, the material will be duplicated, and they will work properly. If you want to make it work on Editor, please use a different material for each projector. I have figured out the crash problem in unity5.6. I don’t know why this can cause the crash in unity 5.6. But after I change the code, the crash is gone. Also you can skip the code once in Update function if the editor has just called the OnValidate function. It will fix the crash too. Thank you for finding the workarounds! This information is really helpful. hello , this is a very good asset. When I use it to cast a shadow of a character，that the Batches add 20 or more . so ,Is there something wrong with me? 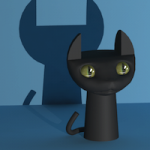 Hi, blurring shadow texture and making mipmaps need some draw calls (Graphics.Blit). If you want to reduce it, check ‘Single Pass Mipmap Blur’. I am looking to an alternative to Unity realtime shadows. If you have only one shadow projector, it will be faster than Unity realtime shadow, but if you have more, it might be slower than Unity realtime shadow. It depends on the scene. Anyway, please try Dynamic Shadow Projector first, and if you like it, try Fast Shadow Receiver. If I set Blur Level or Mip Level to anything other than zero, I get a gray quad for a shadow, and another gray quad rendered on the ground plane. Setting both to zero is the ONLY way to get a shadow representative of what you would expect from a sphere, given the lighting setup (and, of course, the shadow is un-blurred and jagged). Additionally, I get the previously identified “Rendering camera ‘SoftShadowProjector’, but calling code does not set it up as current camera (current camera: ‘Main Camera’)” error. Setting the Blur Level to 1 and tweaking the Blur Size slider causes the same error to stack up in the console. Same deal with the upping the Mip Level to anything greater than zero. Basically, unless you want a visually unacceptable shadow or a gray quad (and it’s mysterious randomly-rendered evil twin ) the tool doesn’t work. By looking at the source it seems you put quick a lot of thought and effort into implementation, so it’s a shame it doesn’t work. 🙁 Did Unity throw a monkey wrench into the works with recent changes to their code? Actually, similar issue occurred since Unity 5.6 beta, and I added a workaround for it. 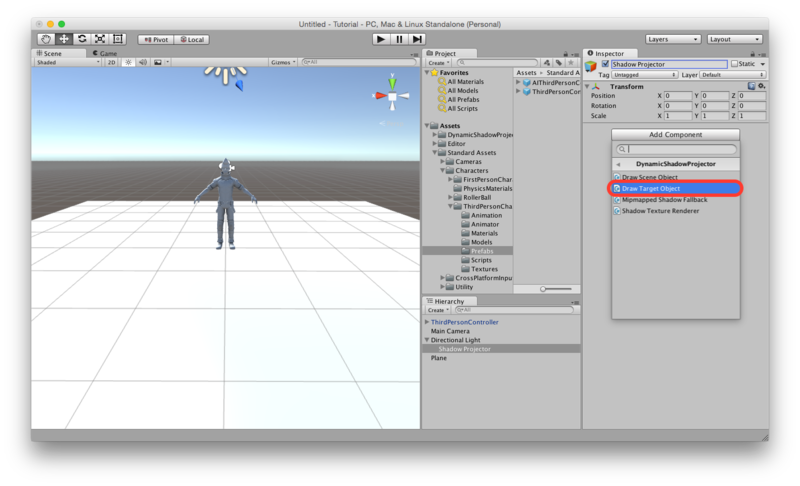 However, in Unity 5.6.1, this issue happened again, and the workaround no longer worked. I already sent a bug report to Unity. I couldn’t find any workarounds so far. Only Unity 5.6 has this issue. 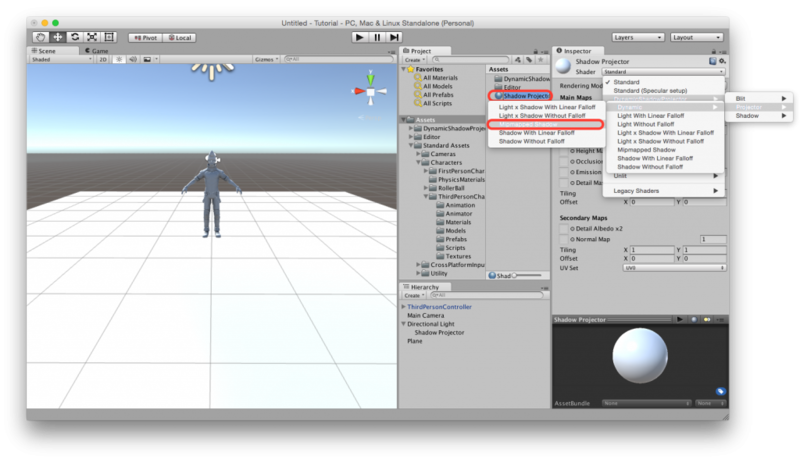 Unity 5.5 and Unity 2017 have no problem.